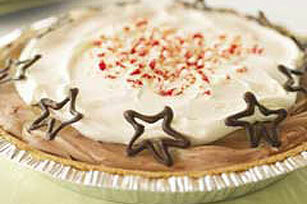 Get a taste of the sweet life with this Peppermint-Chocolate Pudding Pie. This easy, creamy Peppermint-Chocolate Pudding Pie is sure to be a success! Beat milk and pudding mixes with whisk 2 min. ; spoon 1-1/2 cups into crust. Top with marshmallows. Stir 1-1/2 cups COOL WHIP into remaining pudding; spoon over pie. Refrigerate 3 hours. Meanwhile, pour chocolate into resealable plastic bag. Snip off small corner from bottom of bag; use to squeeze chocolate into 10 desired shapes on waxed paper-covered baking sheet. Refrigerate until firm. Top pie with remaining COOL WHIP, crushed candy and chocolate shapes just before serving. This easy-to-make dessert is perfect to bring to a party since it serves 10. To keep marshmallows from turning hard, store them in the freezer. When thawed, they're soft, like fresh marshmallows.